For this training I have permission to use the free membership account of my daughter Louise. What does a free member see? Can a free member read blogs and follow? Yes a free member can read all the blogs and can follow other people. Can a free member like blogs, training and comments? Yes, a free member can click the like button on a blog, training and comment. Can a free member reply on blogs? 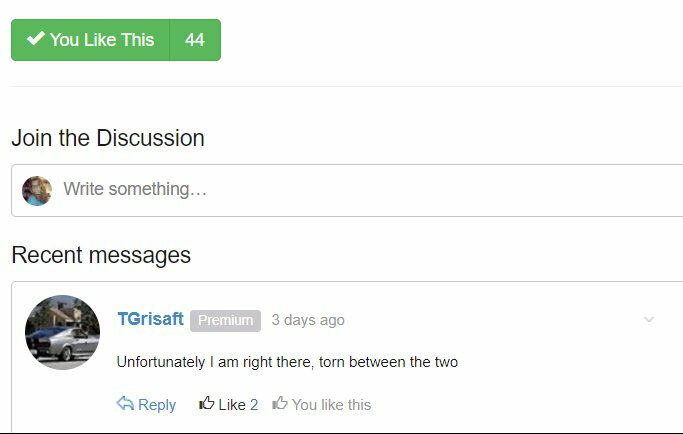 No, a free member can not place comments. Can a free member write blogs? No, a free member can't write a blog, that is only available during the first 7 day trial period. I have a question some members has brought up to me from time to time, can a premium member go back to being a free member without losing all the work they have done on their website? I think the reasoning behind this is fair. You learn everything here, start making a success of things and then go back to free. Do you expect WA to carry that for free forever? We get so much here for so little. Surely you can make enough to cover your monthly subscription? I am aware of that but from what I have read on here that is free membership from the get go not free membership to premium and then back to free. As far as I know it ends after doing that. If I remain a free member, will my website stay active as long as I stay active on here, or can it be pulled at any time? Is there any advance notice if they decide to remove a website? Yes your website will stay active. No there is no notice, as far as I know, when you log in at least once a month to WA and your website, it will stay active, they will not remove the site, it will be dormant when you stay away too long. That's quite obvious, there are members who start a website and then abandon it. And never come back. 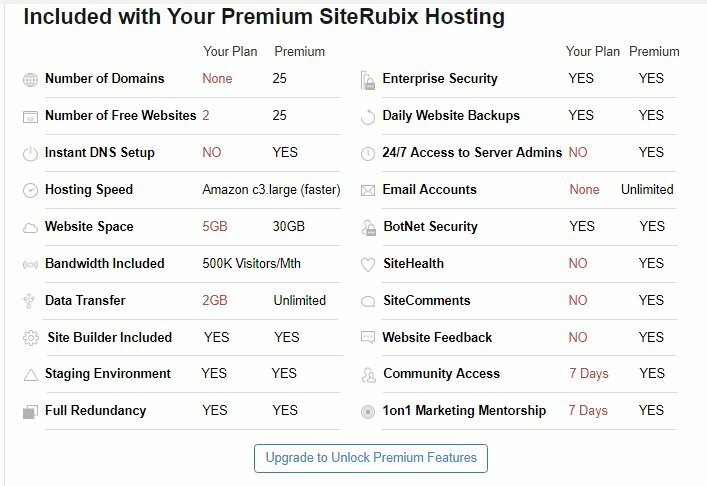 You have 30 days to move your sites to different hosting. Your sites will be maintained in the WA system until then. If you renew before the 30 days is up, your sites will be there and waiting for you. Here is a blog from Leo about this issue Can You Cancel A WA Premium Membership And Come Back? 1. Does WA provide Website Security Package for her free members? Your blog mentions it does but the WA comparative table says otherwise. It says Website Security Package is not available to Free Members. 2. 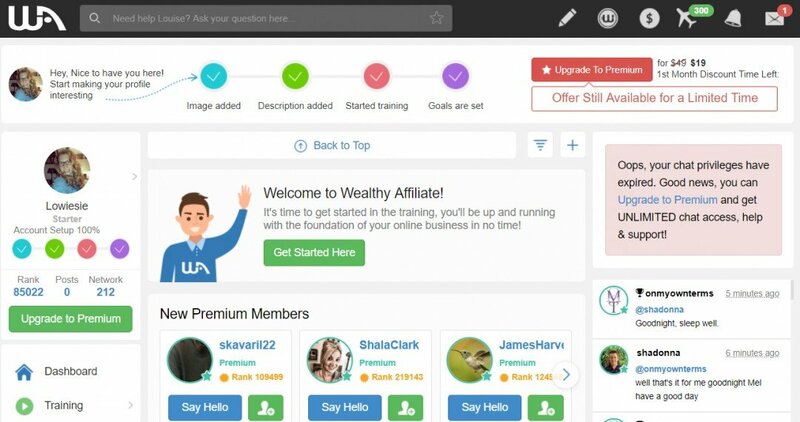 Does WA offer Personal Affiliate Blogs to her free members? Your blog says it doesn't but the WA comparative table says otherwise. 3. How many themes are available to WA free members? This was not mentioned in your blog. 4. What is the Website Storage Space available for Free members? Thanks you so much again for this great blog. Hoping to read from you soon. It's look like your daughter has been here for more than 7 days as she can no longer access the Live Chat. In the comparison table between Starter and Premium, under Starter, "Live Help - 7 Days." Is Live Help also our Live Chat? vital. Which is how it should be. Unfortunately I had to go through this training for real and it was a great discomfort, because I was worried people wouldn't understand why I only clicked the like button without writing anything, in a way appearing as quite unpolite. So this is very useful for all those who could go jointless premium to understand the starters better. Thanks Loes. This is a great training to share with prospects. That is a very informative post, Loes...it will certainly come in handy for many people. I understand, and I'm pretty sure many will benefit...thanks to you. Very helpful information. It's good to be placed on the shoes of our free members. We can now understand them more. Thanks! This is very helpful, thank you for a taking the time to set this out, it helps clarify things. Thanks, Loes! You are providing a real sneak peak of the privileges of a free starter member from your's daughter's free account. Much appreciated, and, much needed too. There were many confusions there and when one is promoting WA, one should be clear of all the advantages and disadvantages of being a free member. What say? Loes is an information big Gun of WA. I motivated you? That's nice! Thats great Loes! Thank you. Will use this as a tool for newbies that jump in or ask about it if that is ok with you? Thank you for your very thorough research and explanations. This training is much needed. Nice to see how everything looks from the "free" perspective. Thanks Loes! Thanks very much Loes for this information. It is very helpful indeed as I need to update by WA review and wasn't certain of what's available with WA free membership.. Thanks for the clarification Loes. The restrictions sound pretty reasonable to me for FREE starter membership. What IS available clearly demonstrates the power and value of being a Premium member. It's not free by the $ numbers, but it certainly is by the VALUE numbers, because of the long list of internet business services the come with a Premium membership. I have a question. Should I as a Premium members have the complete new side bar functionality that you show above? I do not. I see it in the gray background when I go to my log in page, but once I complete that process the side bar of my profile page looks the same as it always has ... the old side bar. Many thanks for this Loes. Having been a premium member for such a long time, I've wondered what the free starter account looked like now & what new members could see & do. So thanks for this great reminder. Seeing your screenshots was very useful to me. Many thanks Loes for this training. Ah ... Thank YOU Loes, this is PERFECT training to send my new signups to! What an awesome training. Thank you ever so much. Thanks Loes, that's a great layout and explanation. I agree with Judy-B..Glad I'm Premium. Thank you, Loes and Louise. My daughter Leanne is 21. Around the same age. My daughter turned 21 in June! Six months older. So both were born in 1996. This is such an awesome & much-needed training, Loes!! Thank you! Excellent tutorial and thanks for centralizing all of this information in one place! Its great for reference for future prospects! Much appreciated...Thanks Loes!...and good luck for your daughter!